Most ready-mix concrete suppliers ask for the amount needed in terms of cubic yards. Use this calculator to find volume of cubic yards for your concrete project. Step #1 - Figure the width, length and thickness of the concrete in terms of feet. To convert to feet, divide your inches by 12. For example, a 4 inch thick patio is 1/3 (4 inches divided by 12 inches). Step #2 - Multiply the width in feet X length in feet X thickness in feet and divide by 27 (the number of cubic feet in a cubic yard). This number will yield the total amount of concrete needed in terms of cubic yards. This formula doesn't allow for waste or variations in thickness. It's recommended additional concrete be ordered in the amount of 5 to 10 percent to cover these variations. Usually it's sufficient to order a quarter of a cubic yard above what the project will actually need. So in the above example, round 2.46 to 2 1/2 and order 2 3/4 yards of concrete to account for waste. For curved concrete projects, make a square around the perimeter of your project and use those measurements for length and width. You may have a little bit of waste. Concrete weighs 150 pounds per cubic foot. A cubic yard weighs 4050 pounds or two tons. Therefore, be aware that hauling a concrete truck up to a pour site may cause damage to lawn or landscaping that the concrete truck must drive over. Since landscaping and lawn can be damaged from a concrete truck, you may haul the concrete with a power buggy, pump it to the site with a concrete pump, or use the old-fashioned wheelbarrow to transfer concrete to the site. If you do this, remember to keep loads small enough to handle. 1 yard of concrete = 12 full wheelbarrows. The average patio requires 2-3 yards of concrete. This will be about 40+ wheelbarrows full. The desirable properties of concrete are plasticity, workablity, nonsegregated, and uniformity. Plasticity - This refers to the ability of the concrete to be readily molded, yet change its shape slowly if the mold is removed. The degree of the plasticity influences the quality of the finished product. Workability - This refers to the ease or difficulty of placing concrete in the form. A well-porportioned and workable mix will gradually slump to lower elevations and retain its original identity. A poor mix will crumble, segregate and fall apart. Nonsegregated - Concrete should be handled so there is a minimum to segregation and the mix will remain homogeneous. For example, don't allow concrete to free fall more than 5 feet to keep the concrete homogeneous. Uniformity - Every batch of concrete should have the right "ingredients" (gravel, sand, cement and water) in the right proportion. When concrete is uniform, it will stay strong upon curing. Once the concrete is hardened and finished, it should be strong, durable and water-tight. Strength - This is the ability of the concrete to resist weight, compression and flexing. The strength is increased by using less water in the mix. Durability - This is the ability of the concrete to resist the elements such as wind, frost, snow, ice, and chemicals (such as salts to get rid of ice in the winter). As the water-cement ratio is increased in the concrete mix, the durability will decrease. Air-entraining agents (an additive the concrete supplier or you can add to the mix) improve the durability of the concrete. Water-Tightness - It's essential to have concrete that is water-tight. Air-entraining agents also help the concrete to be more water-tight. 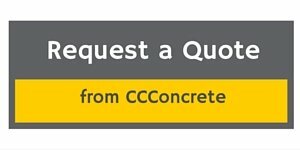 Cost of Concrete - Find out how concrete compares in cost to other paving options. Rebar Calculator - Find out how much rebar is needed for your project.